Hamilton hosts annual spring food drive and raffle - Hamilton School District. 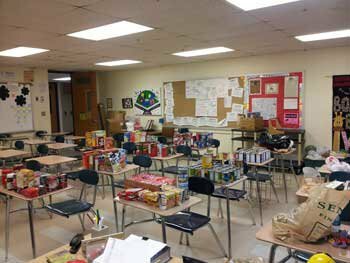 Hamilton High School students collected 400 food items to contribute to Sussex Outreach Services (SOS) Food Pantry. Student Council members organized the food drive and raffle. For every two items students donated, they received one raffle ticket and for every five items, they received three tickets. Raffle items included a $25 gas card, a pair of Brewers tickets and a 2013-14 parking pass.